[Elohim] - [Jehovah] - [Jesus] [Christ] = God ( Vajtswv ). Chinese Bible, Thai Bible, Vietnamese Bible. OT: Gen, Exo, Lev, Num, Deu, Jos, Jud, Psa, Ecc, Pro, Zec, Mal. NT: "we have completed the translation a year ago and it is now waiting to be read through by the men of our mission- church." 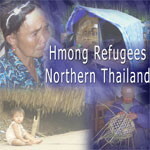 Background on Hmong Refugees in Huay Nam Khao, Thailand. See their plight, how they got there. 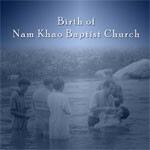 See the miraculous birth of a church in the Hmong Refugee Camp in Northern Thailand. NKBC built their building without the help of American money - even though they are refugees, living in terrible conditions. See how God blesses their indigenous work. 26 Hmong children deported to Laos without their parents. This is their story & the cry of their parents. Humanitarian Aid to the Hmong Refugees in Huay Nam Khao, Thailand.